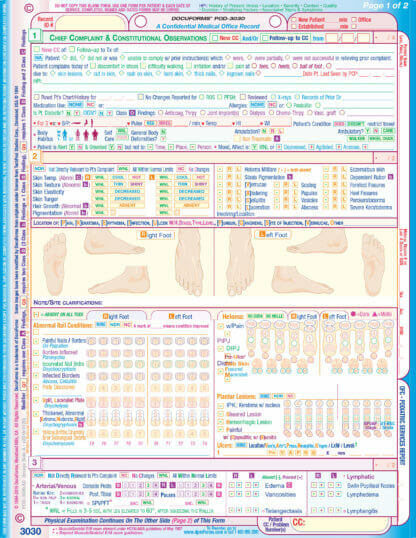 DocuForms’ POD-3030 Podiatric Services Report will be your most frequently used form. It’s appropriate for both new and established patients, plus follow-up visits. 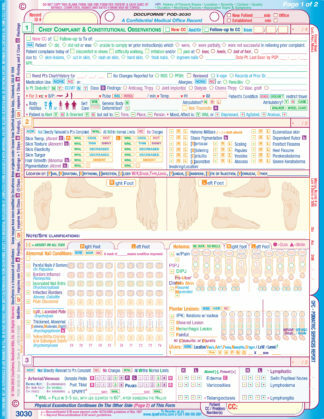 It allows you to properly document your evaluation and treatment of most common, everyday procedures that you perform. For 75-80% of presenting patients it’s the only progress note you need. 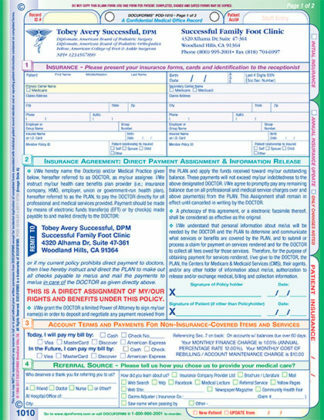 DocuForms’ POD-3030 Podiatric Services Report eliminates the majority of handwritten, dictated or computer generated notes! 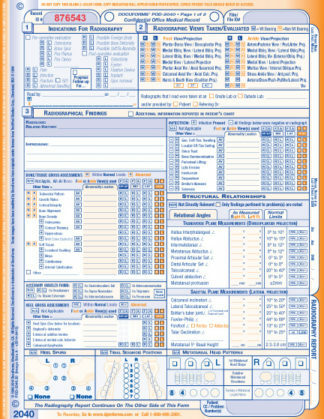 With this form, you will find that you can now keep your charts current in a fraction of the time and costs of other charting systems. 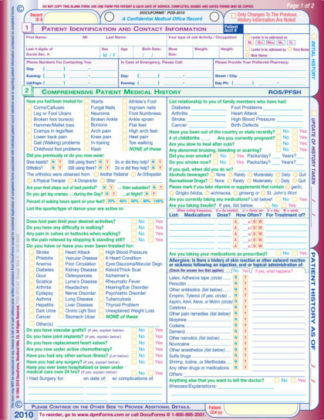 This form is your most frequently used and essential exam form; appropriate for both new and established patients plus follow-up visits. It allows you to properly document your evaluation and treatment of the most common, everyday prodders you perform. For 75-80% of presenting patients it’s the only progress note that you need. The POD-3030 easily guides you through a S.O.A.P. formatted progress note to document positive and negative findings in a check-it-off, fill-it-in fashion. 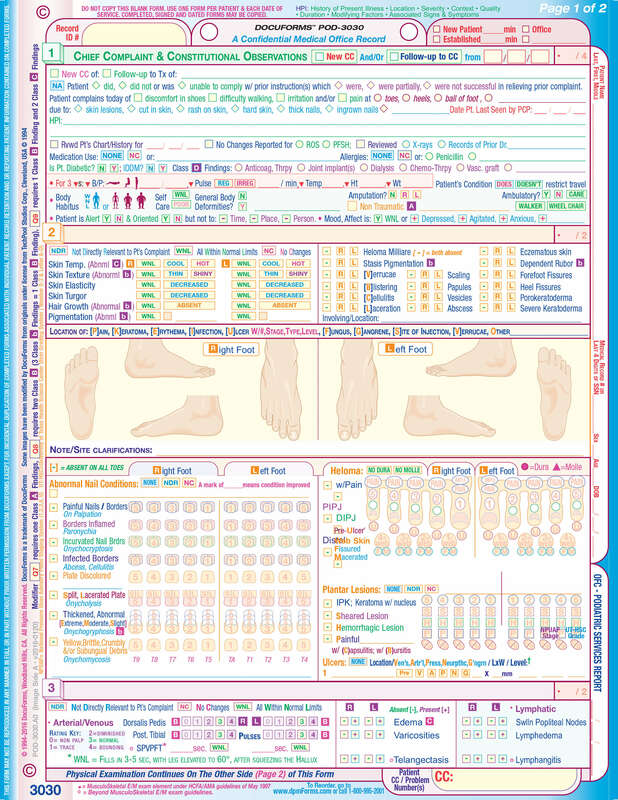 You can quickly move through initial and follow-up visits using check boxes for Within Normal Limits, No Change, Not Directly Relevent, None, plus boxes with a – for absent on both feet or legs or all toes. 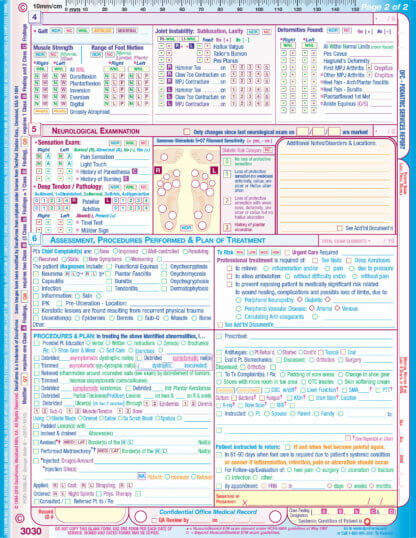 It’s so quick and easy to use that you can complete most charts in the treatment room with the patient. 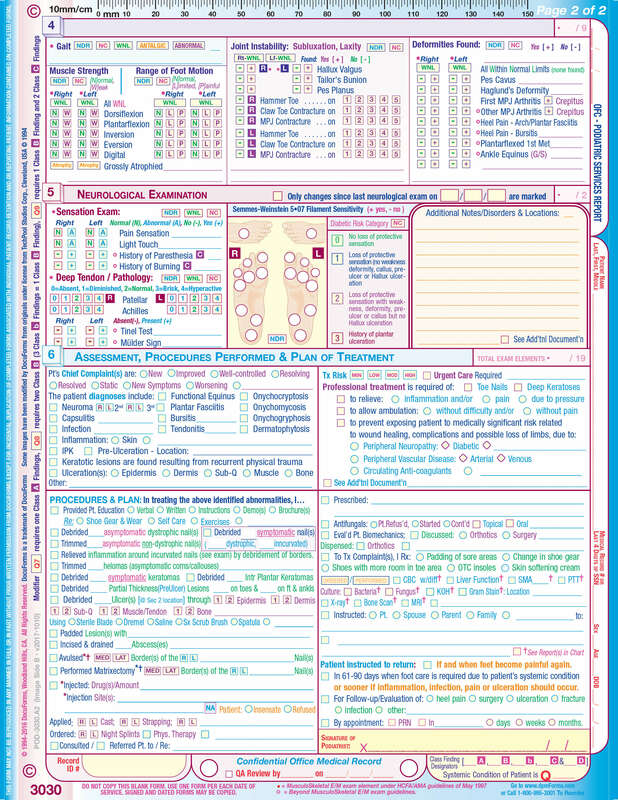 Elements and lines are provided throughout the form for recording additional details to “individualize” your chart notes. The physical exam findings section is organized under a list of 19 possible pediatric-pertinant Medicare Bullets/Exam Elements under the1997 Medicare/AMA Documentation Guidelines. All exam data is recorded under the appropriate bullet. Therefore, you (and the reviewer) will have absolutely no doubt as to the level of exam performed. 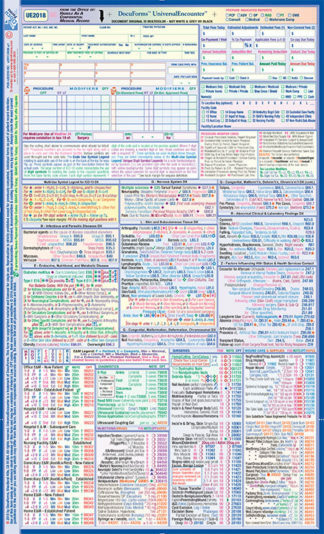 Class-finding indicators and the requirements for establishing medical necessity via Q-codes are clearly provided throughout the exam. A follow-up visit often takes only a minute or less to document since you do not need to repeat the exam findings that have not changed since the previous visit. Just refer to and incorporate your previous E&M report or prior exam findings using the key references provided such as Only changes since __/__/____ are marked. On follow-up visits for “at risk routine care” we also offer the Nail & Skin Care followup, POD-3040 to document 3 “at-risk Routine care” follow-up visits. Abnormal nail conditions are documented down to the individual nail and border. As with the nails, the balance of the exam section of the form, and the Assessment and Plan sections, contain a level of detail and language that has been carefully chosen to meet Medicare requirements. This is the level of detail that your notes must contain to pass a Medicare Audit. If your current notes do not match this level of detail, you’re not going to pass. There’s no other charting method that can capture this data as quickly and accurately as DocuForms.